From April 2nd on the official delivery of CaptainCasa Enterprise Client includes the Beta-version of the “RISC” client. The public availability is scheduled for end of Q2/2016. Follow the normal procedure to create projects, to create dialogs, to add Java behind the dialogs, to manage internationalization, etc. etc. Please find documentation here. Open the menu item “Learn” in order to access tutorials and much more. If your web project is “myproject” and your page is “test1.jsp” then the URL to open the page in the browser is: “http://localhost:50000/myproject/test1.risc?ccstyle=defaultrisc”. JAX 2016 – An exciting conference…! This year’s JAX 2016 was our “coming out”: we first time presented our new Web Client which is based on the “RISC Method” – and received extremely positive feedback. 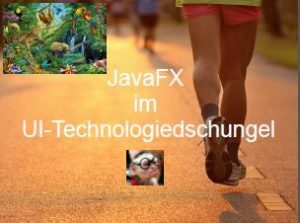 Björn spoke about “JavaFX within the UI Jungle” – and directly compared the three different implementations of the generic rendering client (which is part of CaptainCasa Enterprise Client): the first one in Java Swing the second one in JavaFX – and the last one in HTML-“RISC”.